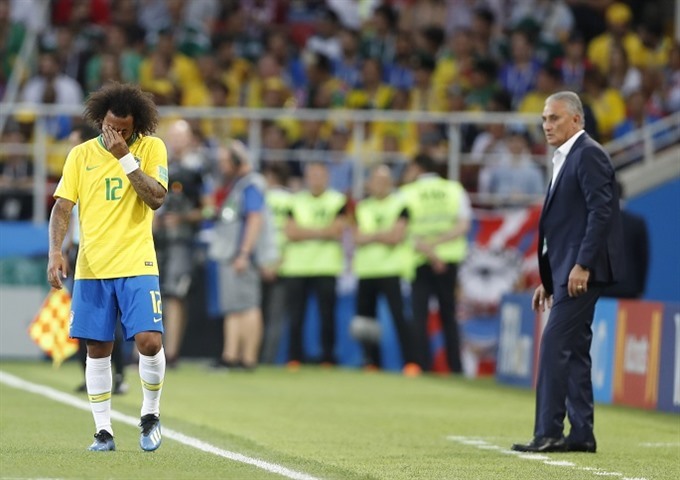 SAMARA — Defender Marcelo will not start for Brazil in their round of 16 match against Mexico because of a back injury, Selecao coach Tite said on Monday. The Real Madrid left-back was forced off in the 10th minute of Brazil’s 2-0 win over Serbia on Wednesday after suffering a back spasm. He was replaced at Spartak Stadium in Moscow by Filipe Luis, who will start in Monday’s match in Samara. "In a normal and natural situation, there is a natural competition for starting spots," Tite told a news conference. "I cannot have unknown variables in this match, he could be hiding something, but he came to training, he wants to participate, he shows the commitment as a team player and might be able to feature for 45, 60 minutes." "At the end of the training, we talked, ’Can I count on you?’ He said ’you can.’"
Tite said he is seeking a similar performance from his team to the one that saw them account for Serbia.